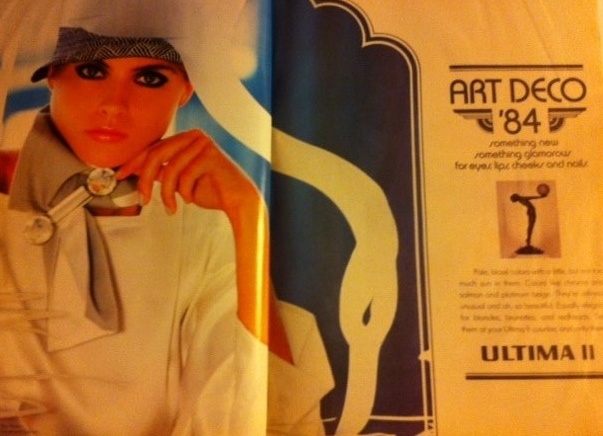 April 1984 was all about the worlds of pop music and fashion colliding in the most exciting way. Every model was dating a rock star. Jerry Hall and Mick Jagger, Paulina Porizkova and Ric Ocasek, and of course, the much admired Renée Simonsen and Duran Duran's John Taylor. I don't have a time machine to take you back to 1984, but for now,let's dive into a few pages of Cosmopolitan's April 1984 issue, featuring cover model Renée Simonsen photographed by the legendary Francesco Scavullo. If you dreamed of dating a pop star, and who didn't - Cosmopolitan was full of the beauty, fashion and fitness tips you needed to closely resemble a rockin' Cosmo Cover Girl. Artfully applied makeup was one way to turn heads in 1984, but there was pressure to be fit. In came the AEROBICS craze of the '80s! Gyms and fitness centres sprouted up on every street corner. There was a ton of nylon and lycra - and Maybelline's Shine Free cosmetics line had this special offer for you: their 100% nylon "running outfit" for only $8.25! Maybelline gets in on the fitness craze! Speaking of running - who can forget OJ Simpson's run from the police in 1994? OK - it was a Bronco chase on the highway - but only ten years earlier, OJ Simpson and Nicole Brown were featured as Cosmopolitan Magazine's COUPLE OF THE MONTH. Whoa! I have no words. OK, I lied - I have a few words: Run Nicole, Run! 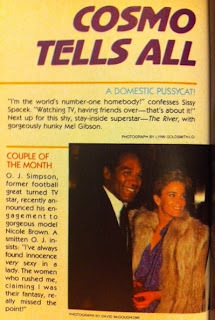 I love looking through these vintage magazines to see how things have changed over the years. Where are the supermodels now? Former model Kathy Ireland is a billionaire entrepreneur. Cindy Crawford and Elle Macpherson are hot on Kathy's heels. Are any of the rockstar/model couples still together? I can think of only one: Paulina and Ric. Today's fashion magazines still promote beauty, fashion and fitness, but they don't have the unique charm (and cheesiness)of the '80s magazines. Yes, we're lucky to have our pilates and yoga classes, but wouldn't you just LOVE to walk into a neon-lit aerobics class all dressed up in your baby pink leotard? With your Sony Walkman on? Oh, I miss you 1984!